Doxycycline came into use in 1967. It is on the World Health Organization's List of Essential Medicines, the most important medications needed in a basic health system. Doxycycline is available as a generic medicine and is generally inexpensive. The wholesale cost in the developing world is between 0.01 and 0.04 USD per pill. In the United States 10 days of treatment is about 14 USD, however some in 2014 were selling it for more than 3.00 to 10.00 USD per pill. Doxycycline may also be used as adjunctive therapy for severe acne. The first-line for treatment brucellosis is combination of doxycycline and streptomycin and the second-line is combination of Doxyxycline and rifampin (rifampicin). Doxycycline kills the symbiotic Wolbachia bacteria in the reproductive tracts of parasitic filarial nematodes, making the nematodes sterile, and thus reducing transmission of diseases such as onchocerciasis and elephantiasis. 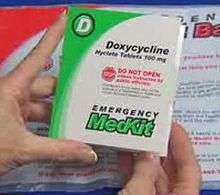 Field trials in 2005 showed an eight-week course of doxycycline almost completely eliminates the release of microfilariae. Doxycycline has been used successfully to treat sexually transmitted, respiratory, and ophthalmic infections. Representative pathogenic genera include Chlamydia, Streptococcus, Ureaplasma, Mycoplasma, and others. The following represents MIC susceptibility data for a few medically significant microorganisms. Cautions and side effects are similar to those of other members of the tetracycline antibiotic group. The combination of doxycycline with dairy, antacids, calcium supplements, iron products, and laxatives containing magnesium is not inherently dangerous, but any of these foods and supplements may decrease doxycycline's effectiveness. Breakfast was observed to reduce doxycycline absorption significantly. Absorption of tetracycline occurs in the stomach and the upper small intestine. Absorption of tetracyclines has been reported to be impaired by milk products, aluminum hydroxide gels, sodium bicarbonate, calcium and magnesium salts, laxatives containing magnesium and iron preparations. The mechanisms responsible for decreased absorption appear to be chelation and an increase in gastric pH. ... In view of these results, it is advisable to instruct the patients to take doxycycline on an empty stomach. Previously, doxycycline was believed to impair the effectiveness of many types of hormonal contraception due to CYP450 induction. Recent research has shown no significant loss of effectiveness in oral contraceptives while using most tetracycline antibiotics (including doxycycline), although many physicians still recommend the use of barrier contraception for people taking the drug to prevent unwanted pregnancy. Doxycycline is categorized by the FDA as a class D drug in pregnancy. As with all tetracycline antibiotics, it is contraindicated in pregnancy through infancy and childhood up to eight years of age, due to the potential for disrupting bone and tooth development. Therefore, doxycycline should not be administered to children under the age of eight except in the treatment of anthrax, or where other medications are contraindicated or ineffective. Doxycycline crosses into breastmilk. The adverse effects on teeth and long bones of children directly administered tetracycline antibiotics is documented, but these effects have not been recorded in infants exposed through breastmilk. Although the dose an infant would receive through breastfeeding would likely be minimal, a theoretical risk exists. Expired tetracyclines or tetracyclines allowed to stand at a pH less than 2 are reported to be nephrotoxic due to the formation of a degradation product, anhydro-4-epitetracycline causing Fanconi syndrome. In the case of doxycycline, the absence of a hydroxyl group in C-6 prevents the formation of the nephrotoxic compound. Nevertheless, tetracyclines and doxycycline itself have to be taken with precaution in patients with kidney injury, as they can worsen azotemia due to catabolic effects. After penicillin revolutionized the treatment of bacterial infections in WWII, many chemical companies moved into the field of discovering antibiotics by bioprospecting. American Cyanamid was one of these, and in the late 1940s chemists there discovered chlortetracycline, the first member of the tetracycline class of antibiotics. Shortly thereafter, scientists at Pfizer discovered terramycin and it was brought to market. Both compounds, like penicillin, were natural products and it was commonly believed that nature had perfected them, and further chemical changes could only degrade their effectiveness. Scientists at Pfizer led by Lloyd Conover modified these compounds, which led to the invention of tetracycline itself, the first semi-synthetic antibiotic. Charlie Stephens at Pfizer worked on further analogs and created one with greatly improved stability and pharmacological efficacy: doxycycline. It was clinically developed in the early 1960s and approved by the FDA in 1967. As its patent grew near to expiring in the early 1970s, the patent became the subject of lawsuit between Pfizer and International Rectifier that wasn't resolved until 1983; at the time it was the largest litigated patent case in US history. Instead of a cash payment for infringement, Pfizer took the veterinary and feed-additive businesses of International Rectifier's subsidiary, Rachelle Laboratories. In January 2013, the FDA reported shortages of some, but not all, forms of doxycyline "caused by increased demand and manufacturing issues". Companies involved included an unnamed major generics manufacturer that ceased production in February 2013, Teva (which ceased production in May 2013), Mylan, Actavis, and Hikma Pharmaceuticals. The shortage came at a particularly bad time, since there were also shortages of an alternative antibiotic, tetracycline, at the same time. The market price for doxycycline dramatically increased in the United States in 2013 and early 2014 (from $20 to over $1800 for a bottle of 500 tablets), before decreasing again. Doxycycline is available worldwide under many brand names. Doxycycline is available as a generic medicine and is inexpensive. The wholesale cost is between 0.01 and 0.04 USD per pill. At subantimicrobial doses, doxycycline is an inhibitor of matrix metalloproteases, and has been used in various experimental systems for this purpose, such as for recalcitrant recurrent corneal erosions. Doxycycline has been demonstrated to reduce the in vitro growth of human cancer cells (breast and prostate), possibly through G1 phase cell cycle arrest. Doxycycline and other tetracyclines are also highly osteotropic, and in animal models of breast cancer bone metastases, doxycycline treatments have reduced the growth of breast cancer tumours in the bone. Doxycycline has been used successfully in the treatment of one patient with lymphangioleiomyomatosis, an otherwise progressive and fatal disease. It has also been shown to attenuate cardiac hypertrophy (in mice), a deadly consequence of prolonged hypertension. In chronic obstructive pulmonary disease, doxycycline has been shown to improve lung functions in patients with stable symptoms. Doxycycline is also used in "tet-on" (gene expression activated by doxycycline) and "tet-off" (gene expression inactivated by doxycycline) tetracycline-controlled transcriptional activation to regulate transgene expression in organisms and cell cultures. Doxycycline is more stable than tetracycline for this purpose. Chronic inflammatory lung diseases (panbronchiolitis, asthma, cystic fibrosis, bronchitis). Both doxycycline and minocycline have shown effectiveness in asthma due to immune suppressing effects. Treatment of filariasis and onchocerciasis due to filariae and onchocercae. In general, harbouring endosymbiotic Wolbachia bacteria, doxycycline kills the bacteria, and (by removal of the endosymbiotes) the nematodes. Doxycycline and other member of the tetracycline class of antibiotics are often used as research reagents in in vitro and in vivo biomedical research experiments involving bacteria as well in experiments in eukaryotic cells and organisms with inducible protein expression systems using tetracycline-controlled transcriptional activation. The mechanism of action for the antibacterial effect of tetracyclines relies on disrupting protein translation in bacteria, thereby damaging the ability of microbes to grow and repair; however protein translation is also disrupted in eukaryotic mitochondria impairing metabolism and leading to effects that can confound experimental results. 1 2 3 4 5 6 7 8 "Doxycycline calcium". The American Society of Health-System Pharmacists. Retrieved Aug 18, 2015. ↑ Nelson, ML; Levy, SB (December 2011). "The history of the tetracyclines.". Annals of the New York Academy of Sciences. 1241: 17–32. doi:10.1111/j.1749-6632.2011.06354.x. PMID 22191524. 1 2 Hamilton, Richard J. (2011). Tarascon pharmacopoeia (2011 library ed., 2011 ed., 12th ed.). Sudbury, MA: Jones & Bartlett Learning. p. 79. ISBN 9781449600679. 1 2 "Doxycycline". International Drug Price Indicator Guide. Retrieved 18 August 2015. ↑ Sweet RL, Schachter J, Landers DV, Ohm-Smith M, Robbie MO (1988). "Treatment of hospitalized patients with acute pelvic inflammatory disease: comparison of cefotetan plus doxycycline and ana doxycycline". Am. J. Obstet. Gynecol. 158 (3 Pt 2): 736–41. PMID 3162653. ↑ Gjønnaess H, Holten E (1978). "Doxycycline (Vibramycin) in pelvic inflammatory disease". Acta Obstet Gynecol Scand. 57 (2): 137–9. doi:10.3109/00016347809155893. PMID 345730. ↑ Määttä M; Kari O; Tervahartiala T; et al. (2006). "Tear fluid levels of MMP-8 are elevated in ocular rosacea—treatment effect of oral doxycycline". Graefes Arch. Clin. Exp. Ophthalmol. 244 (8): 957–62. doi:10.1007/s00417-005-0212-3. PMID 16411105. ↑ Quarterman MJ, Johnson DW, Abele DC, Lesher JL, Hull DS, Davis LS (1997). "Ocular rosacea. Signs, symptoms, and tear studies before and after treatment with doxycycline". Arch Dermatol. 133 (1): 49–54. doi:10.1001/archderm.133.1.49. PMID 9006372. ↑ Walker DH, Paddock CD, Dumler JS (November 2008). "Emerging and re-emerging tick-transmitted rickettsial and ehrlichial infections". Med. Clin. North Am. 92 (6): 1345–61, x. doi:10.1016/j.mcna.2008.06.002. PMID 19061755. ↑ Dahl EL, Shock JL, Shenai BR, Gut J, DeRisi JL, Rosenthal PJ (2006). "Tetracyclines specifically target the apicoplast of the malaria parasite Plasmodium falciparum". Antimicrob. Agents Chemother. 50 (9): 3124–31. doi:10.1128/AAC.00394-06. PMC 1563505 . PMID 16940111. ↑ Lalloo DG; Shingadia D; Pasvol G; et al. (February 2007). "UK malaria treatment guidelines". J. Infect. 54 (2): 111–21. doi:10.1016/j.jinf.2006.12.003. PMID 17215045. ↑ "Doxycycline spectrum of bacterial susceptibility and Resistance" (PDF). Retrieved 4 May 2012. ↑ Nadelman RB, Luger SW, Frank E, Wisniewski M, Collins JJ, Wormser GP (1992). "Comparison of cefuroxime axetil and doxycycline in the treatment of early Lyme disease". Annals of Internal Medicine. 117 (4): 273–80. doi:10.7326/0003-4819-117-4-273. PMID 1637021. ↑ Luger SW; Paparone P; Wormser GP; et al. (March 1995). "Comparison of cefuroxime axetil and doxycycline in treatment of patients with early Lyme disease associated with erythema migrans". Antimicrob. Agents Chemother. 39 (3): 661–7. doi:10.1128/AAC.39.3.661. PMC 162601 . PMID 7793869. ↑ Nadelman RB; Nowakowski J; Fish D; et al. (2001). "Prophylaxis with single-dose doxycycline for the prevention of Lyme disease after an Ixodes scapularis tick bite". N. Engl. J. Med. 345 (2): 79–84. doi:10.1056/NEJM200107123450201. PMID 11450675. ↑ Karlsson M, Hammers-Berggren S, Lindquist L, Stiernstedt G, Svenungsson B (1994). "Comparison of intravenous penicillin G and oral doxycycline for treatment of Lyme neuroborreliosis". Neurologe. 44 (7): 1203–7. doi:10.1212/WNL.44.7.1203. PMID 8035916. ↑ Weinstein RS (1996). "Human ehrlichiosis". Am Fam Physician. 54 (6): 1971–6. PMID 8900357. ↑ Karlsson U, Bjöersdorff A, Massung RF, Christensson B (2001). "Human granulocytic ehrlichiosis—a clinical case in Scandinavia". Scand. J. Infect. Dis. 33 (1): 73–4. doi:10.1080/003655401750064130. PMID 11234985. 1 2 3 4 5 6 U.S. Food and Drug Administration. 14 December 2012. Doxycycline, ANDA no. 065055 Label. ↑ Anderson A, Bijlmer H, Fournier PE, Graves S, Hartzell J, Kersh GJ, Limonard G, Marrie TJ, Massung RF, McQuiston JH, Nicholson WL, Paddock CD, Sexton DJ (2013). "Diagnosis and management of Q fever—United States, 2013: recommendations from CDC and the Q Fever Working Group". MMWR Recomm Rep. 62: 1–30. PMID 23535757. ↑ Okada T, Morozumi M, Tajima T, Hasegawa M, Sakata H, Ohnari S, Chiba N, Iwata S, Ubukata K (2012). "Rapid effectiveness of minocycline or doxycycline against macrolide-resistant Mycoplasma pneumoniae infection in a 2011 outbreak among Japanese children". Clin Infect Dis. 55 (12): 1642–9. doi:10.1093/cid/cis784. PMID 22972867. ↑ William Cameron. "Comparison of doxycycline–streptomycin, doxycycline–rifampin, and ofloxacin–rifampin in the treatment of brucellosis: a randomized clinical trial". Retrieved 23 August 2014. ↑ Hoerauf A, Mand S, Fischer K, et al. (2003). "Doxycycline as a novel strategy against bancroftian filariasis-depletion of Wolbachia endosymbionts from Wuchereria bancrofti and stop of microfilaria production". Med. Microbiol. Immunol. 192 (4): 211–6. doi:10.1007/s00430-002-0174-6. PMID 12684759. ↑ Taylor MJ, Makunde WH, McGarry HF, Turner JD, Mand S, Hoerauf A (2005). "Macrofilaricidal activity after doxycycline treatment of Wuchereria bancrofti: a double-blind, randomised placebo-controlled trial". Lancet. 365 (9477): 2116–21. doi:10.1016/S0140-6736(05)66591-9. PMID 15964448. ↑ Center for Global Health, Centers for Disease Control and Prevention (2011). "Doxycycline for Malaria Chemoprophylaxis and Treatment: Report from the CDC Expert Meeting on Malaria Chemoprophylaxis". The American Journal of Tropical Medicine and Hygiene. Retrieved 17 May 2012. ↑ Center for Drug Evaluation and Research (November–December 2004). "European recommendations on the use of oral antibiotics for acne". Food and Drug Administration. Retrieved 31 January 2008. ↑ PubMed Health (July 1, 2016). "Doxycycline (By mouth)". U.S. National Library of Medicine. Retrieved July 16, 2016. ↑ Archer JS, Archer DF (2002). "Oral contraceptive efficacy and antibiotic interaction: a myth debunked". J. Am. Acad. Dermatol. 46 (6): 917–23. doi:10.1067/mjd.2002.120448. PMID 12063491. ↑ Dréno B, Bettoli V, Ochsendorf F, Layton A, Mobacken H, Degreef H (November–December 2004). "European recommendations on the use of oral antibiotics for acne" (PDF). Eur J Dermatol. 14 (6): 391–9. PMID 15564203. ↑ DeRossi SS, Hersh EV (2002). "Antibiotics and oral contraceptives". Dent. Clin. North Am. 46 (4): 653–64. doi:10.1016/S0011-8532(02)00017-4. PMID 12436822. ↑ Mylonas, I (January 2011). "Antibiotic chemotherapy during pregnancy and lactation period: aspects for consideration.". Archives of gynecology and obstetrics. 283 (1): 7–18. doi:10.1007/s00404-010-1646-3. PMID 20814687. ↑ Chung, AM; Reed, MD; Blumer, JL (2002). "Antibiotics and breast-feeding: a critical review of the literature.". Paediatric drugs. 4 (12): 817–37. doi:10.2165/00128072-200204120-00006. PMID 12431134. ↑ Agwuh, KN; MacGowan, A (2006). "Pharmacokinetics and pharmacodynamics of the tetracyclines including glycylcyclines". J. Antimicrob. Chemother. 58 (2): 256–265. doi:10.1093/jac/dkl224. PMID 16816396. ↑ "Principles and methods for the assessment of nephrotoxicity associated with exposure to chemicals". Environmental health criteria: 119. World Health Organization (WHO). ISBN 92-4-157119-5. ISSN 0250-863X. 1991. 1 2 Nelson ML, Levy SB (Dec 2011). "The history of the tetracyclines". Ann N Y Acad Sci. 1241: 17–32. doi:10.1111/j.1749-6632.2011.06354.x. PMID 22191524. 1 2 The Associated Press, 6 July 1983 Pfizer to Get Rachelle Units The New York Times. ↑ Consumer Reports News: 4 February 2013 FDA reports shortage of doxycycline antibiotic. What are your options? ↑ Sudden increase in cost of common drug concerns many, WSMV-TV, 12 March 2013 (updated 26 March 2013). ↑ Rosenthal, Elisabeth, Officials Question the Rising Costs of Generic Drugs, The New York Times, 7 October 2014. ↑ "Costco Drug Information". Retrieved July 31, 2016. ↑ "Doxycycline Hyclate Prices and Doxycycline Hyclate Coupons". GoodRx. Retrieved July 31, 2016. ↑ Dursun D, Kim MC, Solomon A, Pflugfelder SC (2001). "Treatment of recalcitrant recurrent corneal erosions with inhibitors of matrix metalloproteinase-9, doxycycline and corticosteroids". Am. J. Ophthalmol. 132 (1): 8–13. doi:10.1016/S0002-9394(01)00913-8. PMID 11438047. ↑ Duivenvoorden, W. C.; Hirte, H. W.; Singh, G. (1997). "Use of tetracycline as an inhibitor of matrix metalloproteinase activity secreted by human bone-metastasizing cancer cells". Invasion & metastasis. 17 (6): 312–322. PMID 9949290. ↑ Fife, R. S.; Sledge Jr, G. W. (1995). "Effects of doxycycline on in vitro growth, migration, and gelatinase activity of breast carcinoma cells". The Journal of laboratory and clinical medicine. 125 (3): 407–411. PMID 7897308. ↑ Duivenvoorden, W. C.; Popović, S. V.; Lhoták, S.; Seidlitz, E.; Hirte, H. W.; Tozer, R. G.; Singh, G. (2002). "Doxycycline decreases tumor burden in a bone metastasis model of human breast cancer". Cancer Research. 62 (6): 1588–1591. PMID 11912125. ↑ Moses MA, Harper J, Folkman J (2006). "Doxycycline treatment for lymphangioleiomyomatosis with urinary monitoring for MMPs". N. Engl. J. Med. 354 (24): 2621–2. doi:10.1056/NEJMc053410. PMID 16775248. ↑ Errami M, Galindo CL, Tassa AT, Dimaio JM, Hill JA, Garner HR (2007). "Doxycycline attenuates isoproterenol- and transverse aortic banding- induced cardiac hypertrophy in mice". J Pharmacol Exp Ther. 324 (3): 1196–203. doi:10.1124/jpet.107.133975. PMID 18089841. ↑ Dalvi PS; Singh A; Trivedi HR; et al. (2011). "Effect of doxycycline in patients of moderate to severe chronic obstructive pulmonary disease with stable symptoms". Ann Thorac Med. 6 (4): 221–6. doi:10.4103/1817-1737.84777. PMC 3183640 . PMID 21977068. 1 2 Gossen M, Freundlieb S, Bender G, Müller G, Hillen W, Bujard H (1995). "Transcriptional activation by tetracyclines in mammalian cells". Science (journal). 268 (5218): 1766–1769. doi:10.1126/science.7792603. PMID 7792603. ↑ Saraiva IH, Jones RN, Erwin M, Sader HS (1997). "[Evaluation of antimicrobial sensitivity of 87 clinical isolates of vancomycin-resistant enterococci]". Rev Assoc Med Bras (in Portuguese). 43 (3): 217–22. doi:10.1590/S0104-42301997000300009. PMID 9497549. ↑ Dibb WL, Digranes A (1981). "Characteristics of 20 human Pasteurella isolates from animal bite wounds". Acta Pathol Microbiol Scand [B]. 89 (3): 137–41. PMID 7315339. ↑ Greenwald RA (December 2011). "The road forward: the scientific basis for tetracycline treatment of arthritic disorders". Pharmacol. Res. 64 (6): 610–3. doi:10.1016/j.phrs.2011.06.010. PMID 21723947. ↑ Raza M, Ballering JG, Hayden JM, Robbins RA, Hoyt JC (2006). "Doxycycline decreases monocyte chemoattractant protein-1 in human lung epithelial cells". Exp. Lung Res. 32 (1–2): 15–26. doi:10.1080/01902140600691399. PMID 16809218. ↑ Chodosh S, Tuck J, Pizzuto D (1988). "Comparative trials of doxycycline versus amoxicillin, cephalexin and enoxacin in bacterial infections in chronic bronchitis and asthma". Scand J Infect Dis Suppl. 53: 22–8. PMID 3047855. ↑ Joks R, Durkin HG (December 2011). "Non-antibiotic properties of tetracyclines as anti-allergy and asthma drugs". Pharmacol. Res. 64 (6): 602–9. doi:10.1016/j.phrs.2011.04.001. PMID 21501686. ↑ Bachelez H, Senet P, Cadranel J, Kaoukhov A, Dubertret L (2001). "The use of tetracyclines for the treatment of sarcoidosis". Arch Dermatol. 137 (1): 69–73. doi:10.1001/archderm.137.1.69. PMID 11176663. ↑ El Sayed F, Dhaybi R, Ammoury A (2006). "Subcutaneous nodular sarcoidosis and systemic involvement successfully treated with doxycycline". J Med Liban. 54 (1): 42–4. PMID 17044634. ↑ Briest W, Cooper TK, Tae HJ, Krawczyk M, McDonnell NB, Talan MI (2011). "Doxycycline ameliorates the susceptibility to aortic lesions in a mouse model for the vascular type of ehlers-danlos syndrome". J Pharmacol Exp Ther. 337 (3): 621–27. doi:10.1124/jpet.110.177782. PMC 3101011 . PMID 21363928. ↑ "Antibiotics 'could help slow MS'". BBC News. 11 December 2007. Retrieved 31 January 2008. ↑ Minagar, A.; Alexander, J. S.; Schwendimann, R. N.; Kelley, R. E.; Gonzalez-Toledo, E.; Jimenez, J. J.; Mauro, L.; Jy, W.; Smith, S. J. (2008). "Combination Therapy with Interferon Beta-1a and Doxycycline in Multiple Sclerosis: An Open-Label Trial". Archives of Neurology. 65 (2): 199–204. doi:10.1001/archneurol.2007.41. PMID 18071030. ↑ Mishra GP, Mulani JD. "Doxycycline: An Old Drug With A New Role In Idiopathic Pulmonary Fibrosis". International Journal of Pharma and Bio Sciences. V1(2) 2010. ISSN 0975-6299. ↑ Moullan N, Mouchiroud L, Wang X, Ryu D, Williams EG, Mottis A, Jovaisaite V, Frochaux MV, Quiros PM, Deplancke B, Houtkooper RH, Auwerx J (2015). "Tetracyclines Disturb Mitochondrial Function across Eukaryotic Models: A Call for Caution in Biomedical Research.". Celll Reports. 10 (10): 1681–91. doi:10.1016/j.celrep.2015.02.034. PMID 25772356. ↑ Chatzispyrou IA, Held NM, Mouchiroud L, Auwerx J, Houtkooper RH (2015). "Tetracycline antibiotics impair mitochondrial function and its experimental use confounds research.". Cancer Research. 72 (21): 4446–9. doi:10.1158/0008-5472.CAN-15-1626. PMID 26475870.